This weekend, there's some heavy action at the Rock Steady Gym in Indianapolis. A lot of folks are punching bags, flinging left jabs and right hooks - like you would see at most boxing workout gyms. The difference is that folks in these weekend classes have Parkinson's disease. It's a neurological disorder that affects the way you move and the control you have over your body. About a 1.5 million people in the U.S. have Parkinson's. Reporter Colleen Iudice recently met the founder of Rock Steady and tells us his story. I met Scott Newman at his office in the city county building around 7 p.m., the end of another typical 13-hour workday. Scott's an intense guy who walks with a little stagger in his step. He came to Indianapolis to be the city prosecutor, a job he held for eight years. He says he thrived on the courtroom drama, but one day, Scott says something began to happen to his body. "I was delivering an emotional closing argument in a murder trail standing next to the defendant, throwing a $20 bill at him, which is what the murder is all about--a $20 drug deal--and when I did that, my hands started to tremor." He went to the doctor and found out he had early onset Parkinson's disease. He was only 40 at the time. As a criminal prosecutor, Scott's job requires a certain amount of performance and confidence. He was worried Parkinson's would be seen as a weakness. "Instinctively I didn't want anybody to know, so I told my secretary and we arranged things so I would not be forced to reveal the illness in public. I wouldn't sign things in public because I was having trouble signing my name. I used voiced activated software and I had to learn how to use it, but I did it in secret," Scott recalls. Over the next two years, life began to fall apart for Scott. His symptoms got worse. He was getting divorced and living alone in a small apartment. A good friend of his going through a similar rough spot saw his unhappiness and urged him to start a workout regimen. Scott's friend taught him how to box. These workouts were grueling, and many times and he wanted to quit, but his friend wouldn't let him. After several weeks of workouts, Scott said he began to feel better. He had fewer tremors and more balance. He wanted to help other people with Parkinson's. So two years ago, Scott found a donated gym space, and with his own money opened Rock Steady. It's a place where people with Parkinson's can have free intense boxing workout. People at the Rock Steady gym go through a normal boxing routine, but in this class no one actually gets hit. Trainer Kristy Follmar leads group stretches and then she arranges the class into several workout stations. Some people hit the speed bags while others jump rope or hit the heavy bags. After five minutes at one station they switch. One of the students, Mary Yemen, is a petite woman with bifocals on the end of her nose. She wears pink boxing gloves that look oversized on her small frame. She hits the speed bags and hard. "Kristy has flat pads on her hands and she tells you hook, jab or whatever it's just like boxing against somebody without actually hitting them." As Mary hits the flat hand pads, the gym buzzes with activity. These boxers look fierce-- they yell, hit and scream for the entire class. Mary was diagnosed with Parkinson's six years ago. 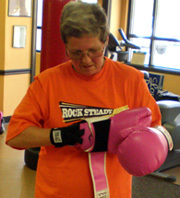 She's been coming to the Rock Steady boxing class four times a week for about a year. She has tried other workouts, but nothing seemed to help her as much as the boxing class. Scott Newman thinks boxing helps people with Parkinson's because it engages and challenges all parts of the body. "Parkinson's is like a thief in the night. It steals all the movement you don't use. So boxing works in every plane imaginable it's never predictable you got to react quickly you are horizontal, vertical up down and every which way." Currently, Scott works as the director of public safety for the city of Indianapolis. He says most days are good, but sometimes he wakes up and finds it's hard to move. He knows Parkinson's is incurable. But these days, he says he's glad just to be signing his own name again. It is great pleasure to bring in your knowledge that we Established LAVA MARTIAL ARTS in 2000 for manufacturering of MARTIAL ARTS UNIFORMS, ACCESSORIES, BOXING GLOVES and EQUIPMENTS etc. Since then we are exporting our products successfully to EUROPE, AUSTRALIA, USA and other markets of the world because of.. Please consult our web site and ask for samples of your choice and we will send you free of any charge with our competitive prices.Thanking you for showing your interest in our products.